on company social media pages, blogs, twitter etc. Use of the label in your promotional materials is only permitted unmodified and only for a period of one year. You may not attribute any statement of fact to Forbes other than your placement on the list in your respective industry. You alone are responsible for the admissibility of the commercial use of the seal under competition law; in this respect, Forbes and Statista give no guarantee and assume no liability. In consideration for payment, you (The Licensee) are hereby granted a nonexclusive, worldwide, non-transferable, non-sub-licensable license during the term of this Agreement for digital use rights (web posting, email, digital presentations, branded social media and similar) and print reproduction use rights (letterhead, sales materials, reports, white papers, brochures, posters and signage and similar) of the Forbes Logo (The Logo) pictured in this agreement. Use Rights specifically exclude television advertising rights which may be obtained separately from Forbes Media LLC (FM) by contacting dlopenzina@forbes.com. Licensee acknowledges and agrees that The Logo and all right, title and interest therein, is and shall remain the exclusive property of FM. Licensee may not attribute any statement of fact to FM beyond your placement on the list in your respective industry. You alone are responsible for the admissibility of the commercial use of The Logo under competition law; in this respect, FM and Statista give no guarantee and assume no liability. Licensee shall not distort, misrepresent, alter the meaning of or otherwise edit The Logo. FM may terminate this Agreement upon 30 days’ written notice if Licensee materially breaches any of the terms of this Agreement; provided, however, that this Agreement will not terminate if the breaching party has substantially cured the breach to the reasonable satisfaction of FM within 30 days of a notice pursuant to this section. Upon termination or expiration of this Agreement, Licensee’s right to use The Logo shall immediately terminate and all rights granted to Licensee hereunder with respect to The Logo shall automatically revert to FM without further notice. This Agreement contains the full and complete understanding of the parties with respect to the subject matter hereof and supersedes all prior representations and understanding, whether oral or written. This Agreement shall be construed and the rights and obligations of the parties shall be governed by the laws of the State of New York, without reference to its conflict of law principles. The list shows the Top 250 Global 2000 companies that achieved the highest compound annual growth rate in revenues between 2014 and 2017. Calculation of growth rates: The calculation of company growth rates is based on the revenue figures given by Forbes 2000. Missing data was researched for the companies in their respective national currency. For better comparability in the ranking, the revenue figures were converted into dollars. The average exchange rate for the financial year indicated by the company was used for this purpose. 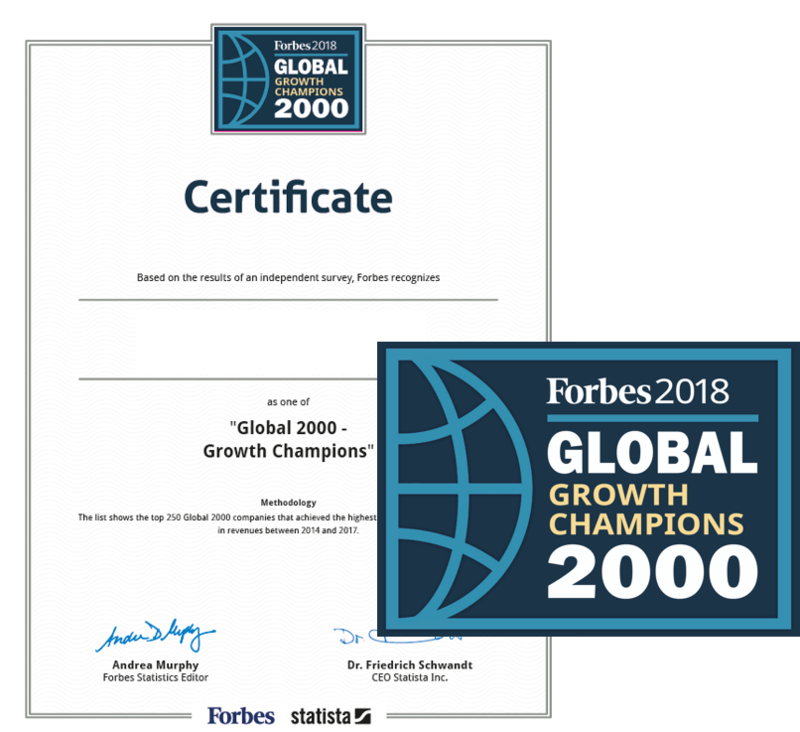 Please visit www.forbes.com/growth-champions/list for the full article and ranking.